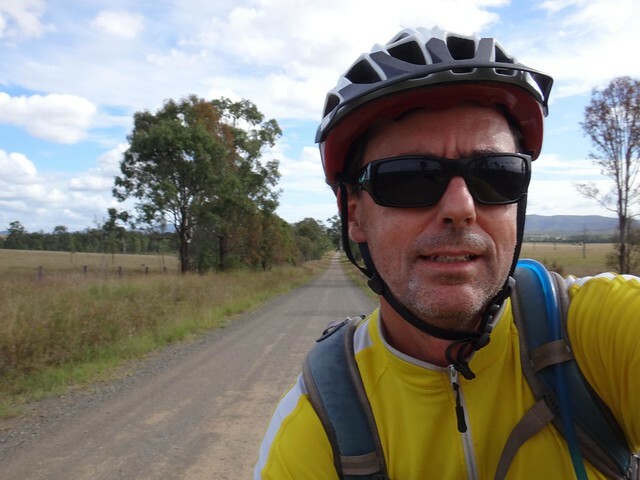 Today’s adventure took us in a big arc from Blackbutt in the South Burnett region to Toogoolawah in the Brisbane Valley. 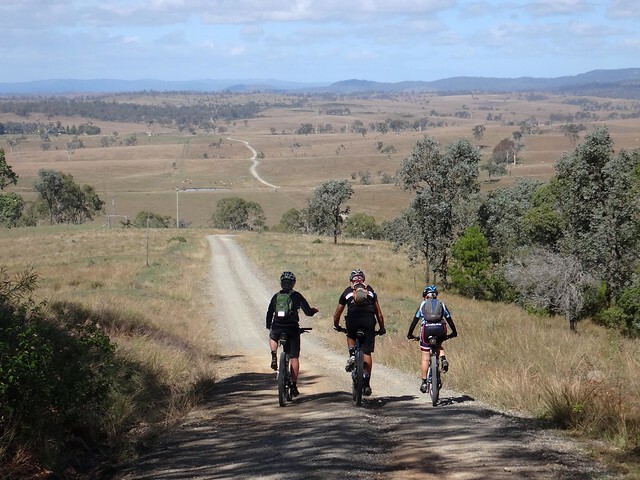 We rode along the Bicentennial National Trail, down the Great Dividing Range and through the endless rolling plains of farmland carved by Emu and Ivory Creeks. I’ve driven much of this route before. 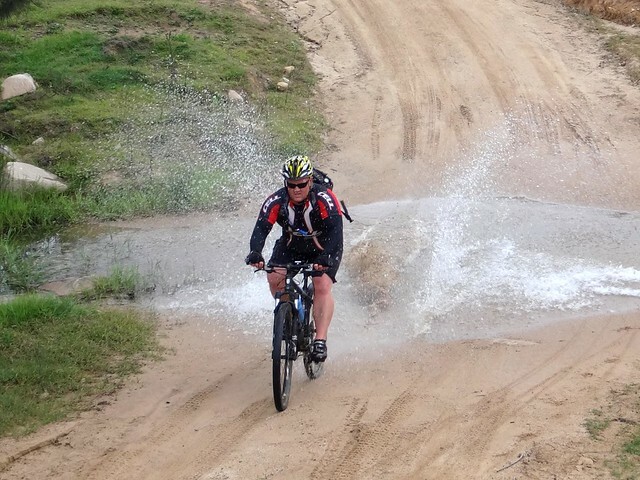 Last year, while recovering from injury, I drove the support vehicle while Eric and Darb rode. 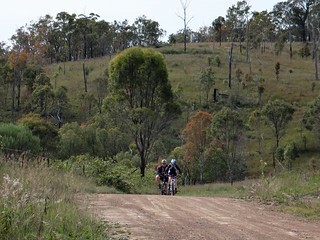 But today I felt lucky to be able to ride my bike with friends through this scenic part of the world. 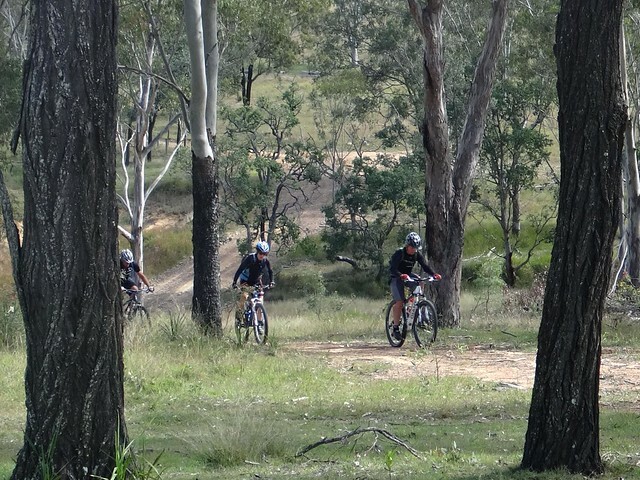 On a fresh autumn morning we rolled out of Blackbutt southward into the forests. Starting our ride on the edge of the mountains, it wasn’t long before we picked up speed as we dropped down the range. 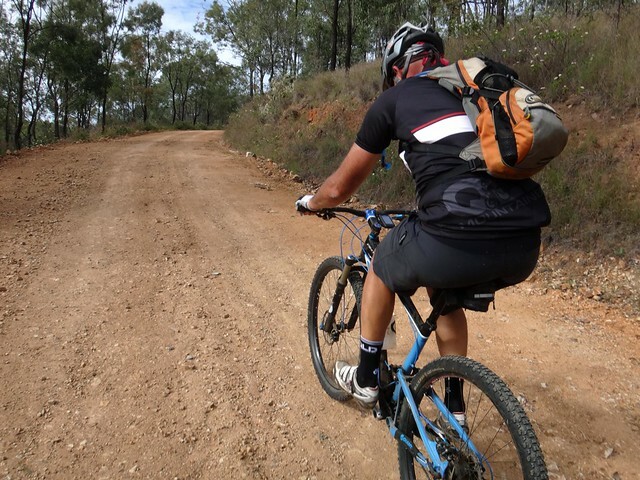 Savouring the wide open spaces, big skies and rolling hills we accellerated downhill with the cool breeze stinging our cheeks. This was a perfect day for a big ride. 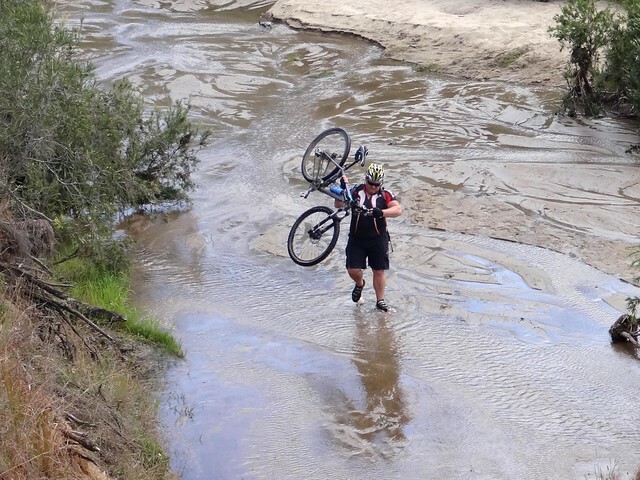 Recent rain had topped up the creeks which splashed us as we rode through. 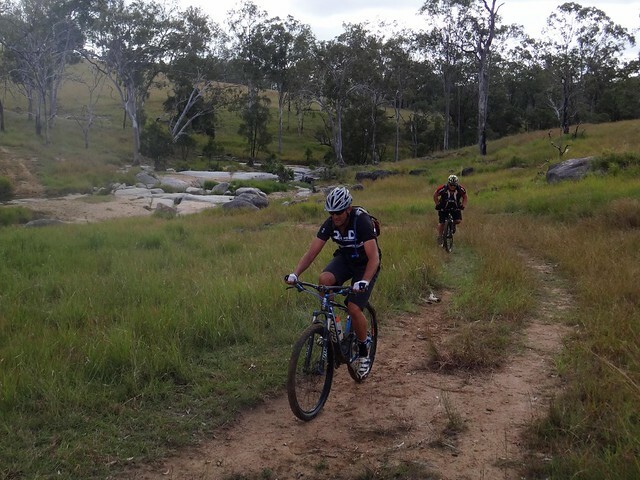 We quickly reached the bottom of the descent, rolling through the boulder-strewn crossing at Emu Creek. 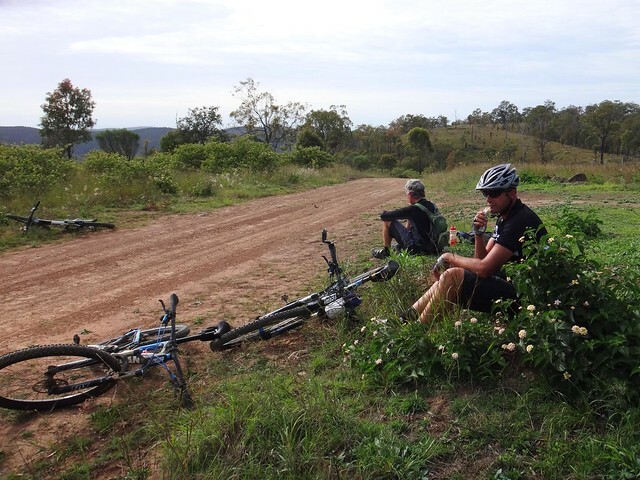 Like most good things, the easy downhill roll came to an end, and we had to work hard to pedal our bikes out the other side. 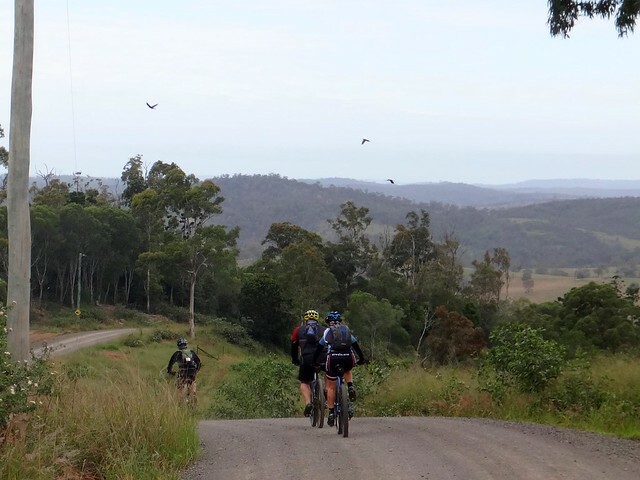 The hill out of Emu Creek climbs about 220 metres in just over a kilometre, with gradients in excess of 25%. It’s a steep climb, so we just dropped into “Granny Gear” and slowly ground upwards. Becca is a strong climber, and reached the top before the rest of us. 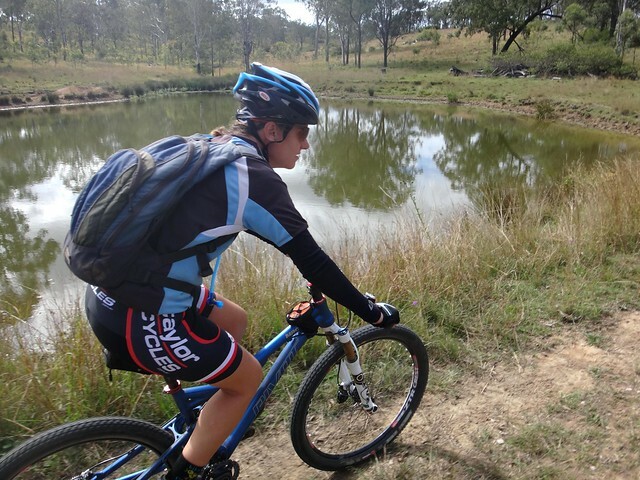 Rather than relax at the top, she rolled back down the hill to slowly ride up with Geoff who was having difficulty pedalling up the hill. I was amazed at Becca’s generosity. At the top of the hill all I wanted to do was relax and catch my breath, but she thoughtfully went “the extra mile”. 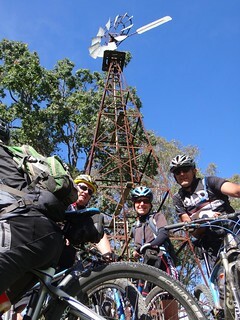 We rested while Becca and Geoff finished the climb. 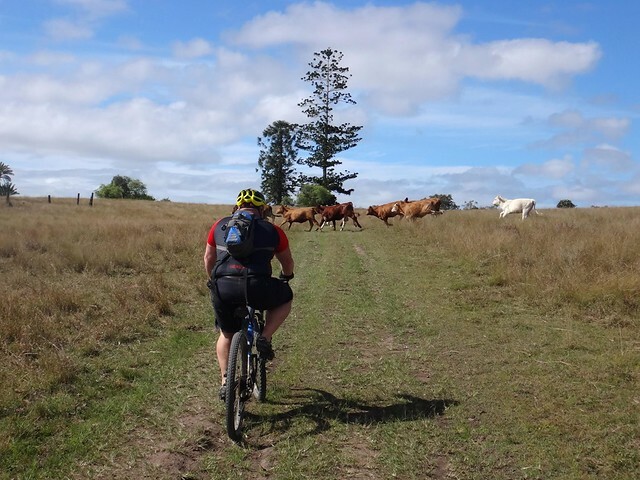 At the top of the hill, the trail rolls over undulating hills, past rusty windmills and through several different cattle properties. The friendly yellow triangles of the BNT cheerfully point out the way. “How’s it going, Geoff?” I asked. “My legs are starting to feel it”, Geoff admitted. 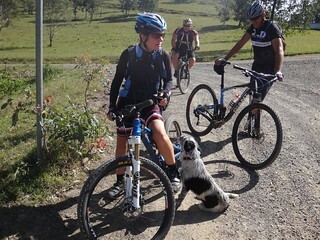 He hadn’t been on the bike for a while, and I think the hills were starting to take their toll. 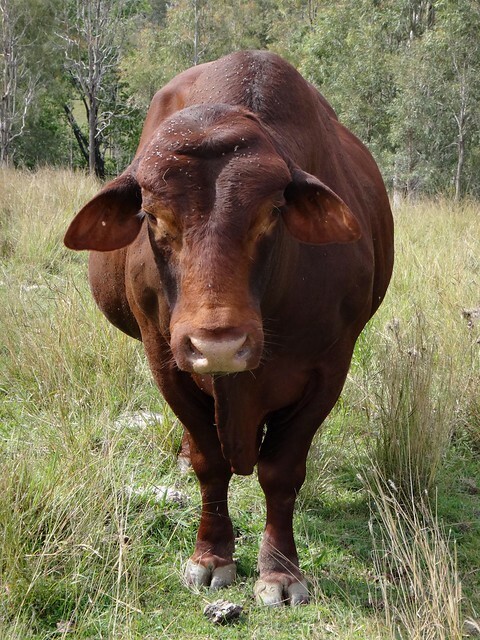 A friendly old cattle dog loped up and said “G’day” as I patted him. A few minutes later I detected the unmistakeable odour of rotting flesh emanating from my hand. I’m pretty sure the dog had been nosing around in a decaying dingo carcass before he greeted us, and he had passed the stench on to me. I think I’ll be a bit more discerning about which dogs I pat in future. 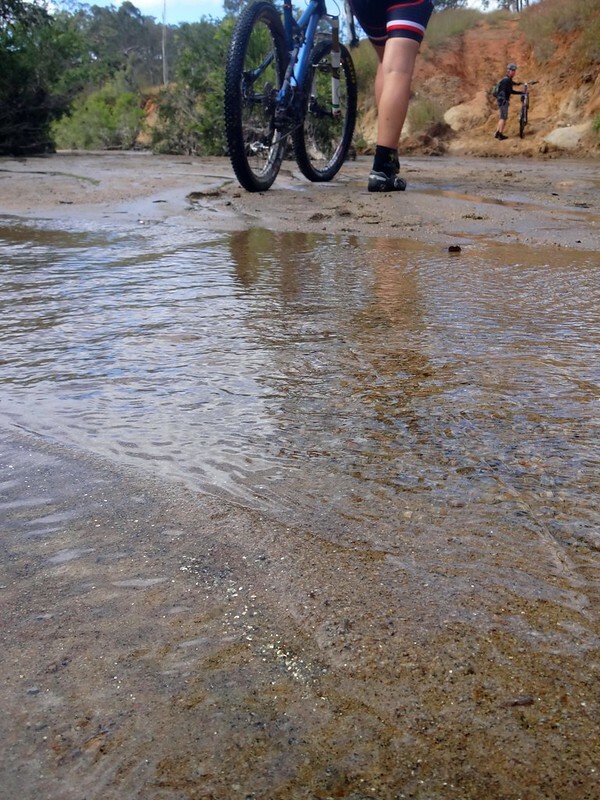 Some folks ride for the exercise, or to beat previous times… I ride for experiences like these. 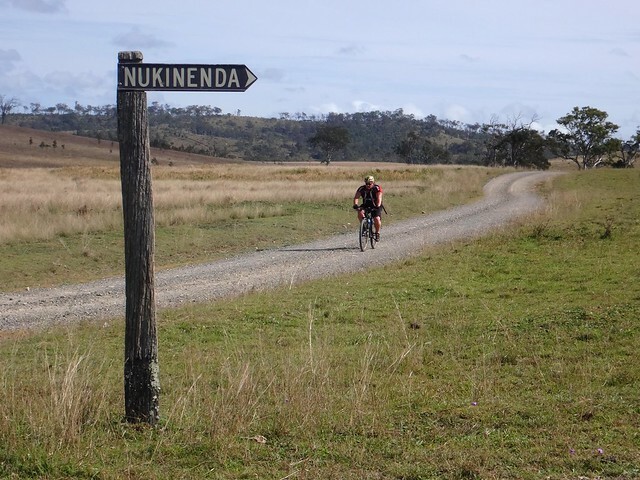 Eventually we left the smooth gravel road for a rough grass track passing through Nukinenda Station – a large cattle property in the district. 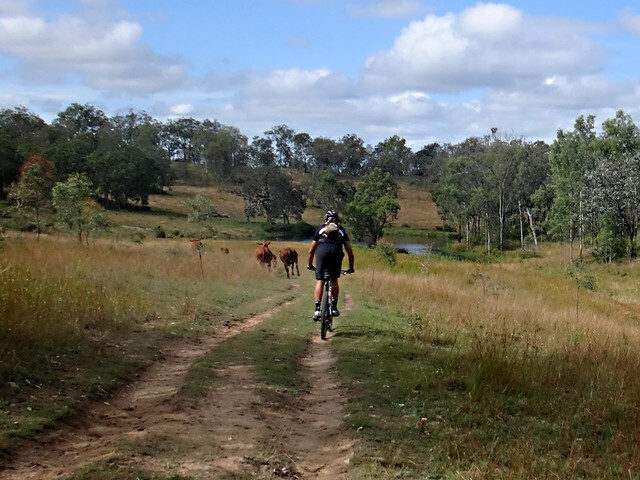 … along bovine single tracks, complete with attendant bovines, and irrigation dams full to the brim with water. Gold flecks sparkled out of the creek bed at us. Eric, a geologist, suggested probably not. Heavy metals like gold would sink to the bottom of the sand rather than sit on the surface. 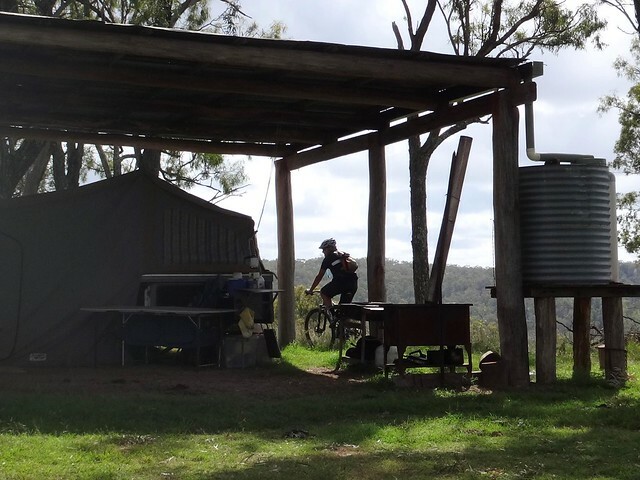 Organizing the ride in the week before, I spoke with the property manager of Eskdale Station, Mark. He assured me that the creeks running through the property were fine for drinking. The water in Maria Creek was crystal clear. Luckily it was a cool day and we didn’t need any more water than what we were carrying with us. 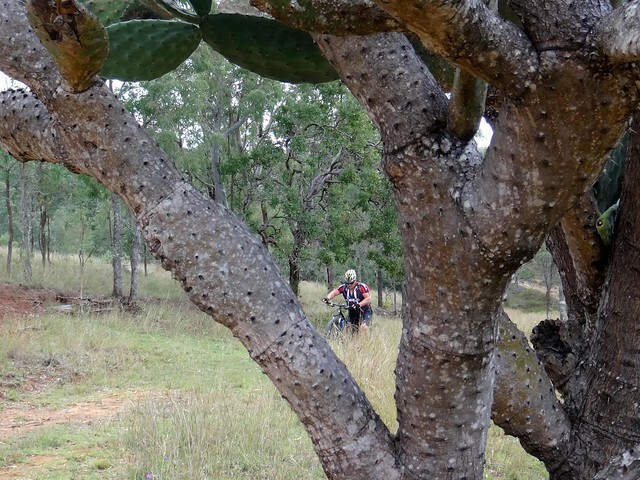 At the top of the next hill we came across this impressive bush camp. No one was home at the time, so we kept rolling. 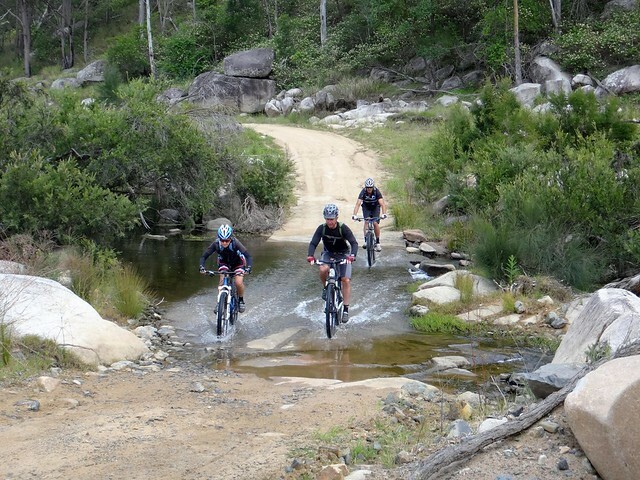 We crossed the creek again riding over large smooth rocks, through river gravel and out the other side. The hills were taking their toll on Geoff. We needed to keep up a reasonable pace in order to get home on time, so we decided to split in two groups. 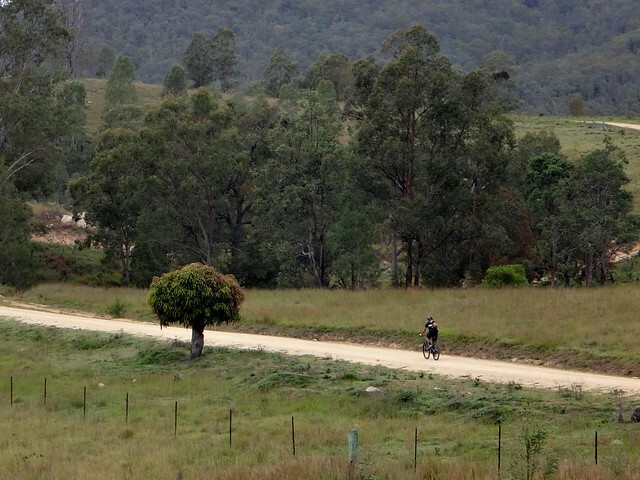 Eric, Becca and Paul would ride ahead while I rode with Geoff to the front gate of Eskdale Station. Geoff and I would be able to take a slower pace, which he would find more comfortable. 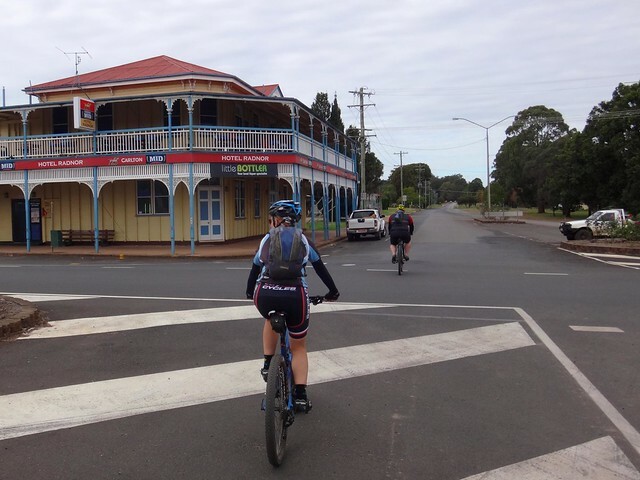 I would leave Geoff to rest at the front gate while I continued into Toogoolawah, while Becca and Paul would drive back in the car and pick him up. Long point-to-point rides are challenging because there’s no bail-out options for people to take short-cuts. It’s important to be flexible. 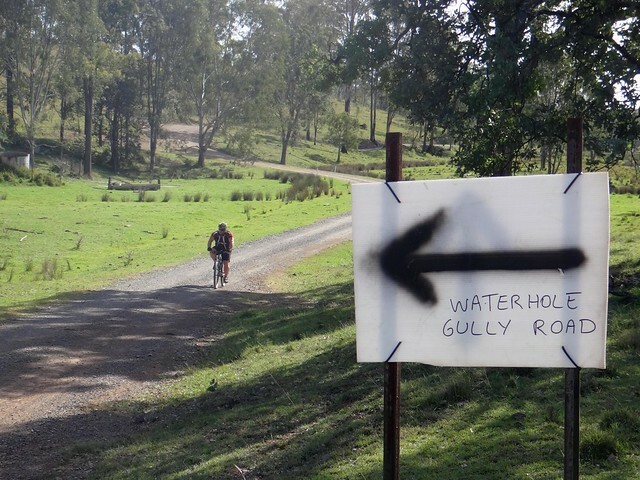 Maronghi Creek is the second major water course which passes through Eskdale Station. 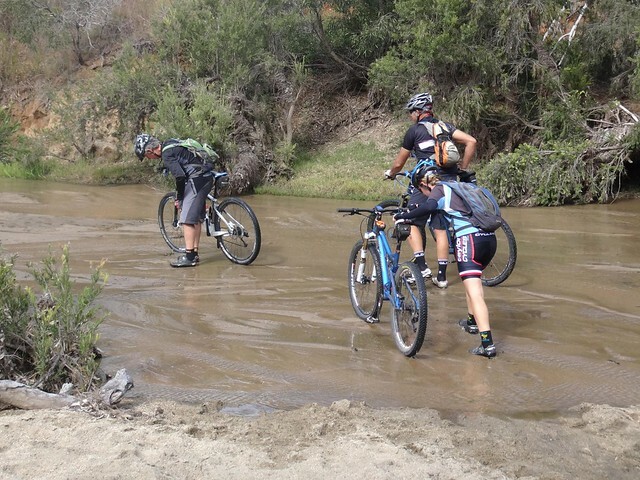 This crossing was a bit muddier, but the water was still nice and clear. 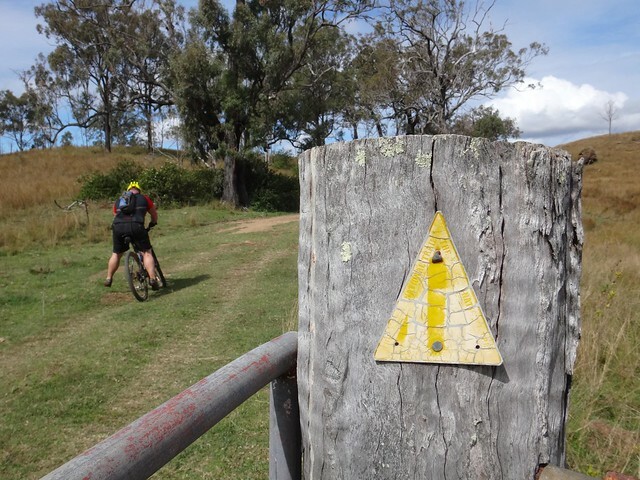 Every so often we’d encounter yet another bright yellow trail marker, reminding us we were still on the Bicentennial National Trail. Whenever I see these markers I often wonder what other travellers have passed this way. Where did they come from? Where were they going? 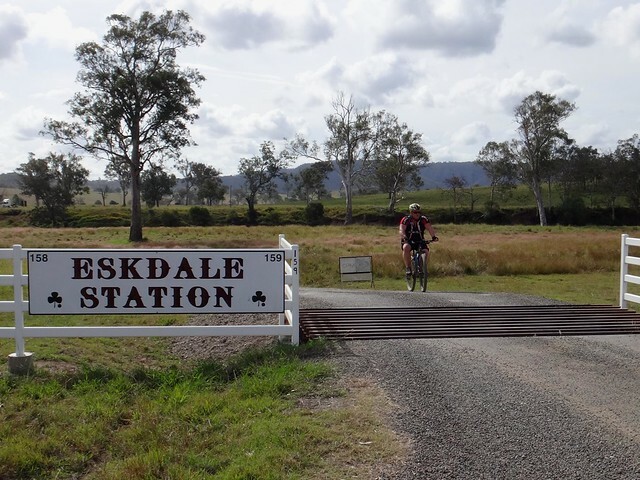 Eskdale Station was huge – and I was grateful to be able to ride through it on such a perfect day. 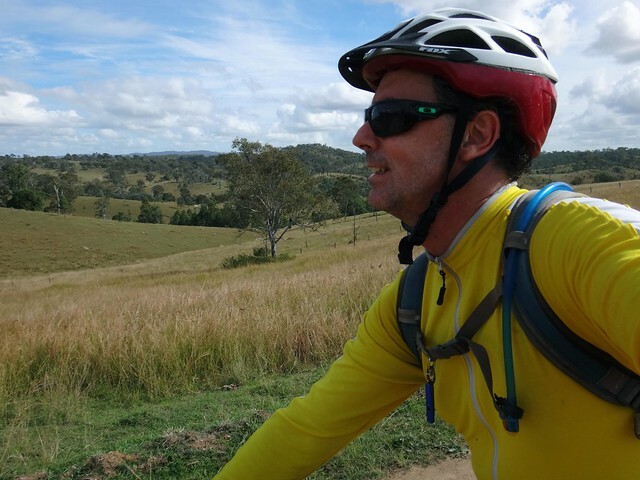 Geoff and I were taking a leisurely pace – I was glad to be here enjoying the open space and rolling hills. 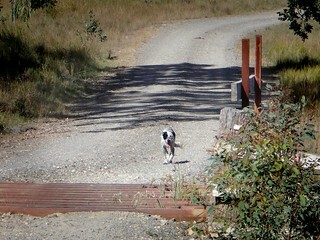 Geoff and I were relieved to finally reach the front gate. We said our goodbyes. He happily found a shady spot under a tree while I rode off down the road to meet up with the others. 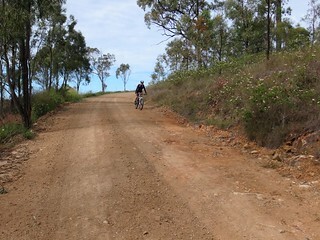 I was alone, in the middle of nowhere, on a secluded gravel road somewhere west of Toogoolawah. I love this solitude, but the only down-side is not having anyone else to photograph – so I compensated by taking a few selfies. 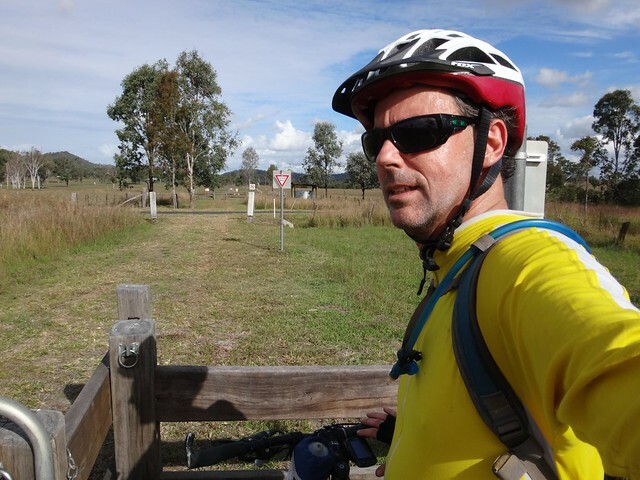 Eventually I hit the Brisbane Valley Rail Trail – the remnants of the railway line which ran through here all the way to Yarraman. 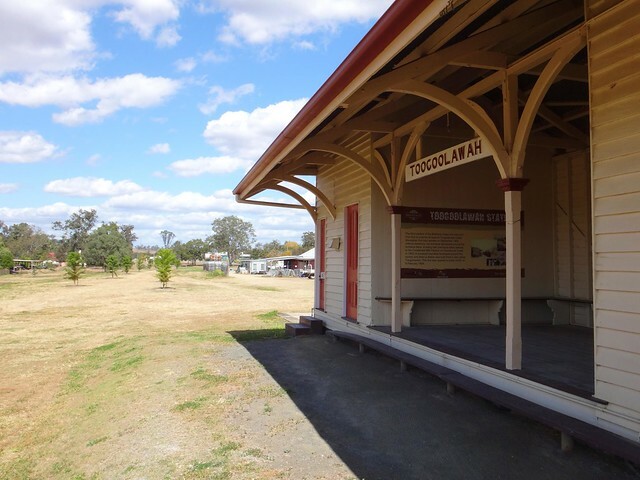 From there it was a quick roll along the former railway line into town in Toogoolawah. The trains may have long departed, but the station is still there. All up we travelled about 70km in about 6 hours. 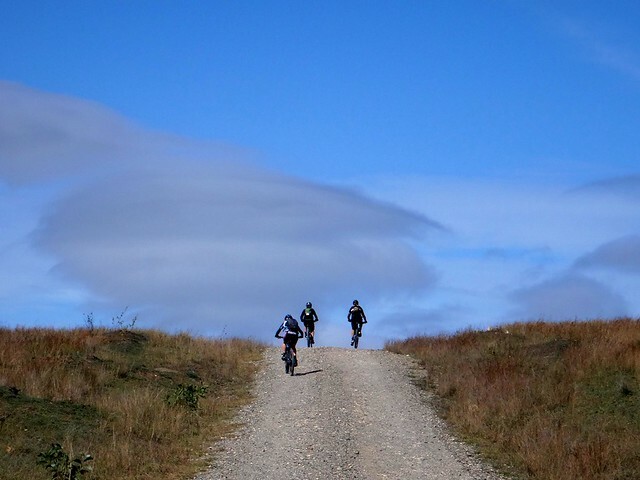 During that time we’d climbed about 1,100 metres and dropped about 1,350 metres – in otherwords we did go downhill, but it was still hard work. I burned about 2,400 kcal. I was able to maintain a much slower pace than the others. They had to ride ahead to get the car while I took it easy. The weather was beautiful and cool. We had plenty of water. On a hot day this would be a gruelling ride. It’s tougher for some than others. 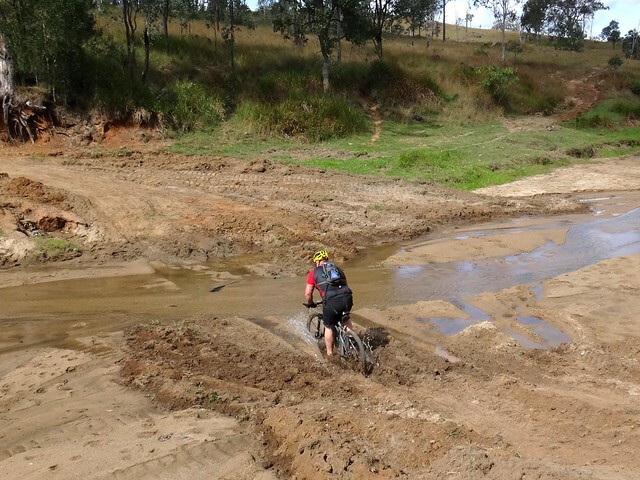 Geoff hadn’t ridden for a while and found this ride very difficult. He wasn’t able to complete it. I suppose the bottom line is that the same ride can be totally different depending on when you’re doing it, and what you’re used to. Thanks Becca, Eric, Paul and Geoff for a great day. This is a stunning part of the world, and I was delighted to be able to return. thanks troops for a trip down memory lane, what a delightful section to visit. the undulating hills clear autumn skies, clean water. i have ridden a horse over the section or part of over the decades and different times of year, with pack horse or just a saddle horse. 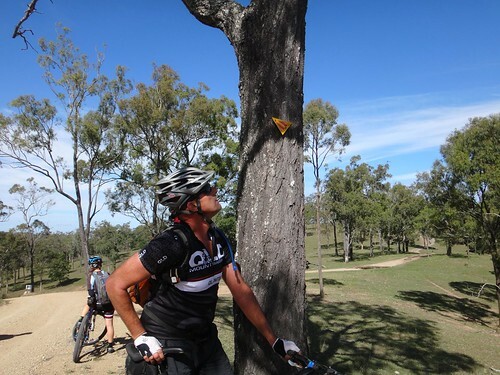 thanks for the picies, great to,recall where the big trees r etc. thanks for your effort. It looks amazing to grand journey. I was to travel, solo along to national trail. 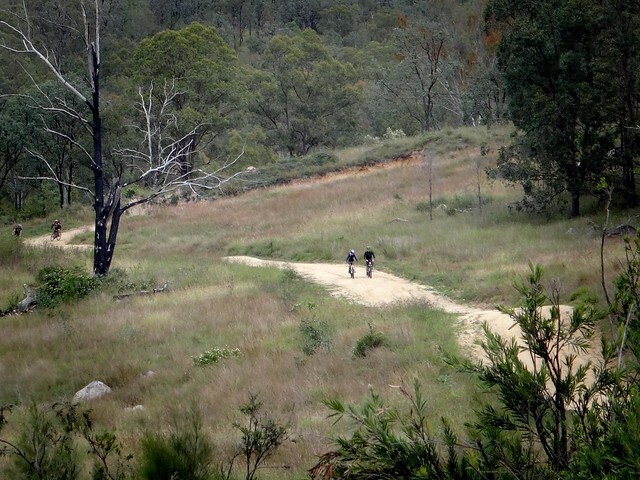 Left onto the Rail Trail 100 metres after Morden Road crosses Camp Creek, 600 metres back from the highway. Yes – we thought it was fools gold 🙂 It looks nice, and the golden color makes for an interesting story!